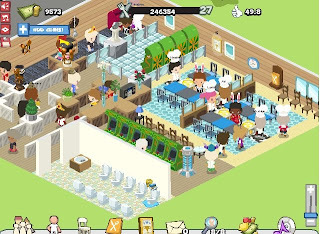 One of the popular application of Facebook today is a game where you can create your own restaurant and make your way to be the top restaurant in the city. This game is none other than Restaurant City. Many Facebook users are familiar with tis game and many became addicted. It's easy to learn, first you are given 2 employees, a stove, 3 tables and chairs. You need 1 cook and one waiter to operate your restaurant. Don't worry, it's not like Diner Dash where you manually command your employees, just place them where you want them to be (cook or waiter) and everything is automatic. Now the numbers on the upper left is your earnings that makes it possible to buy more stuff. The numbers on the upper middle is your Gourmet level, when leveled up, will increase the size of your restaurant (in terms of number of tiles) or allows you to hire more employees (max number is 8). The number on the upper right is your popularity points, which I say is important when you need to level up your restaurant or to earn those cash. The higher the number, the more customers will enter your restaurant. Beware though that you cannot accomodate more that you can cater so it may sometime result to a negative feedback on your behalf. The numbers on your employees represents their health when reached 0% will make them exhausted and not work anymore. you can give them food to regain their strength for a price. The maximum level of your restaurant so far is level 27 and I had reached this level recently. I would like to share these tips for you also to achieve this level with a bit of patience and dedication. 2.) The less your waiter walks, the more time saved when serving the dishes. 3.) Furnitures like chairs and stoves are all THE SAME in terms of function regardless of their price, so spend wisely especially in the beginning. 6.) Your earnings are affected by the health of your employees and your popularity points when you log out. You need 100% health and a minimum of 23 popularity points to get $2000 after 5 hours or longer. 8.) Waiting chairs can help lessen your popularity drop due to customers waiting. but it is advise not to place more than 8 waiting chairs. 9.) Customers when sitted on a waiting chair will proceed to an available arcade machine thus preventing a drop in popularity. 10.) Making a maze for your customers may help delaying them but keep in mind that when a customer enters the restaurant, it will lock-in automatically into a chair. 11.) Level 8 and above will require you to have a toilet for customers who wants to do their "business". So you must require a cleaner to clean the toilet from time to time, This can be troublesome especially if you are in need of cooks and waiters. This can be resolved by going to the design mode, then removing the toilets, return to the restaurant, then go back to design mode to return the toilets. When done, your toilets will be magically cleaned. 12.) You can have a better ingredient if you answered successfully the daily food quiz above 7 seconds. 13.) The day will reset at exactly 8am (Philippine time) thus a new daily quiz will appear during this time. 14.) You don't need to max out all your dishes (Royal a.k.a. level 10). One Appetizer, one main dish and one dessert is all you need. These are just tips for your reference and it is up to you to follow these tips. May you have a successful restaurant and may you enjoy the game.